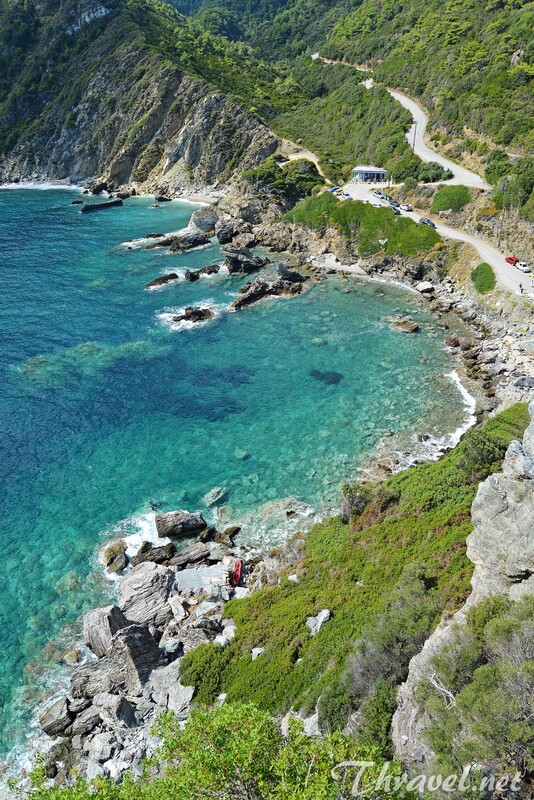 Skopelos Greece is often called “The Jewel of Aegean Sea” because of dense pine forests which cover the island. This Sporades isle is considered to be the greenest Greek island. The Sporades consist of 24 islands. 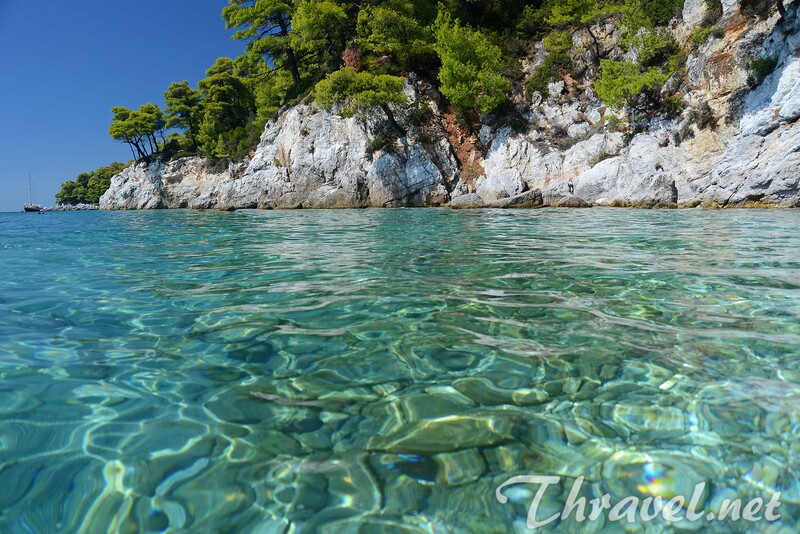 Skopelos is located between Skiathos and Alonissos. Scopelos holidays have become extremely popular since the successful Mamma Mia Movie was filmed there in 2007. Eight years later it looks still unspoiled especially in comparison with hot spots such as Mykonos, Santorini and Corfu. Skopelos island still retains much of its authentic charm. Local people claim that recently there is only 10 percent increase of visitor numbers. The entire population of Skopelos, Greece is about 5000 islanders. 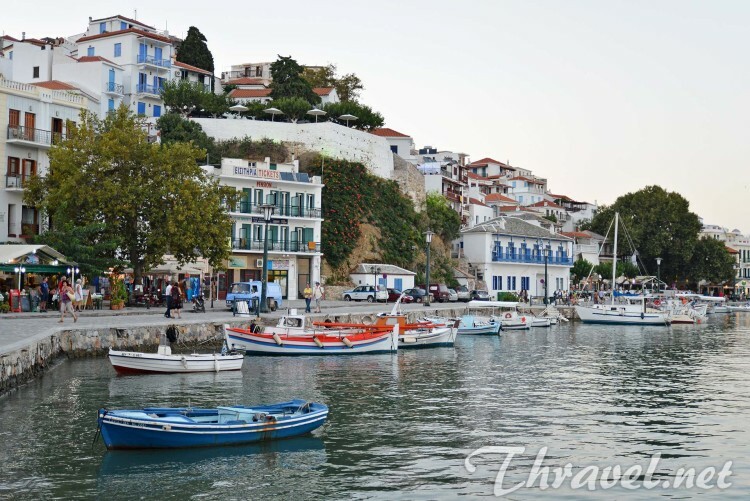 How to Get to Skopelos Greece? There is no airport on the picturesque Greek island of Skopelos so you can get there by plane via the closest Skiathos island. Other close airports are in Volos (Nea Anchialos) and Athens (ATH). Then the transfer from the mainland to the island is by ferry. The recommended port near Athens is Agios Konstandinos. If you land at the Thessaloniki airport you can rent a car and drive to Volos for 4 hours. Another option is to get on fast ferry to Skopelos, Greece. 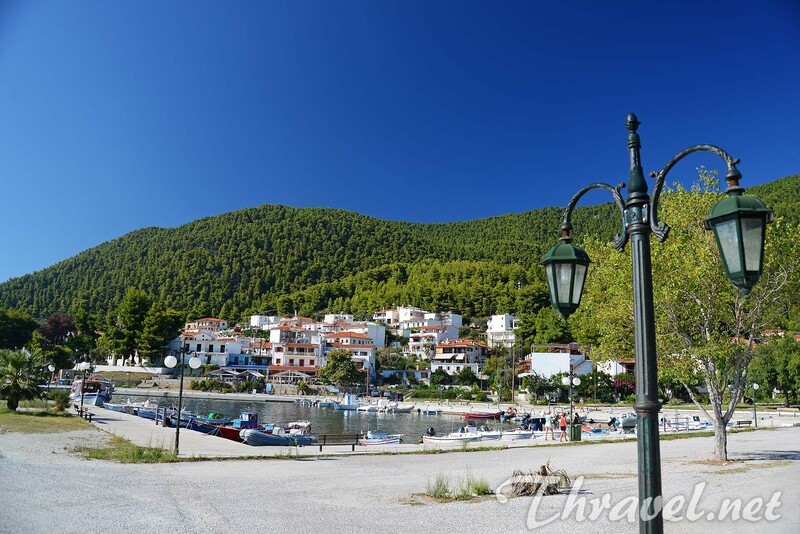 It will take 40 minutes to get from Skiathos to Glossa port on Skopelos by ferry or one hour to the island`s capital Skopelos town which is on the northern coast. The ferry from the mainland city of Volos cruises for almost 5 hours to the main town while the ferry ride to Glossa port is 40-50 minutes shorter. Ferries are busy in July and August so if you are not a big fan of international crowd, consider a trip to Skopelos Greece in September. It is recommended to book a ferry ticket in advance. When approaching the ports, you will be amazed by the green hills and characterful hill houses with minimalist white facades. Both ports are very beautiful. The two main towns on Skopelos Greece feature dozens of small churches. We stayed at Hovolo apartments in Neo Klima village. 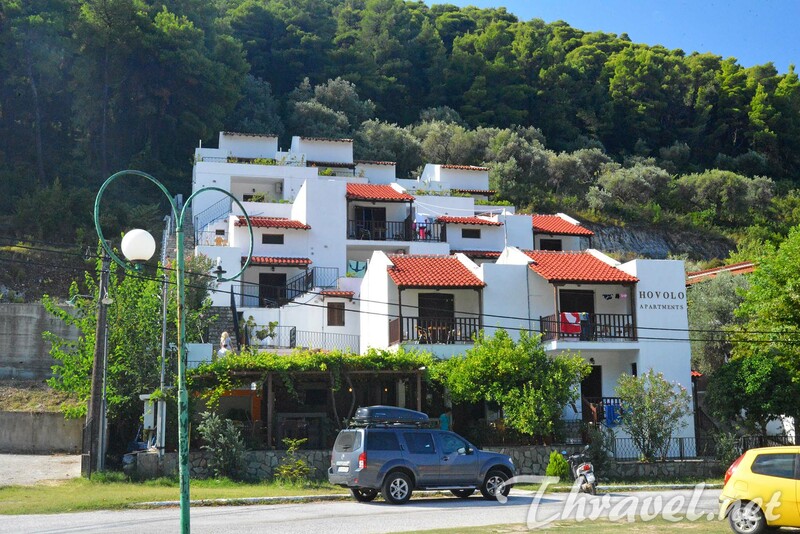 This family run hotel is located on 18 kms from Skopelos town and 10 kms from Glossa. There is a free transportation from the port. 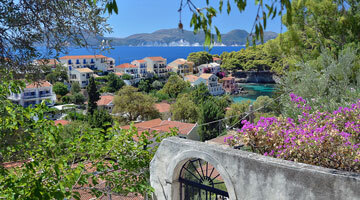 The Hovolo apartments are half an hour drive from Skopelos town. 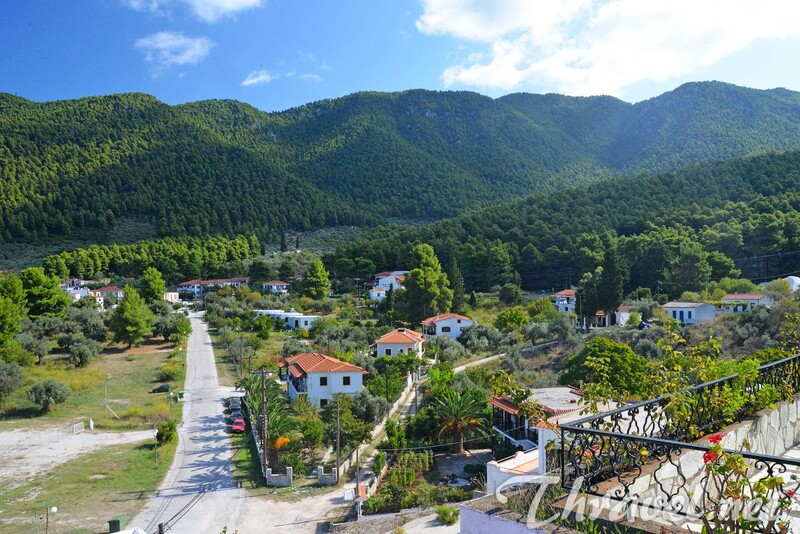 The hotel building is 300 steps from the Elios Klima beach and is located under the slopes of Delphi Mountain. 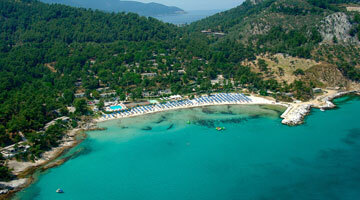 The Skopelos village hotel is 400 meters from the silver sands of Hovolo beach. There are apartments and maizonettes in this lodge. Room numbers 1 and 2 are on the ground floor. We recommend these two Hovolo apartments because of the easy access to them and to the breakfast area in the garden. To the third and fourth floor you have to climb up many stairs that can be difficult for some people. There is an accommodations designed to ensure easy access with a baby carriage or wheelchair. Hovolo apartments with room numbers from 41 to 54 have perfect sea view. 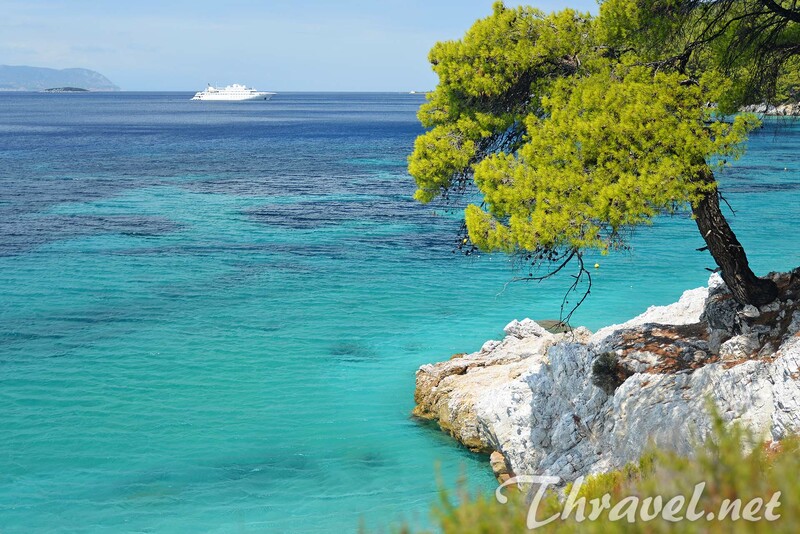 You can enjoy the stunning view of Skiathos island and the fabulous sunset over the Aegean Sea. Here you can watch boats cruising and feel the scent of pine trees in the air. Maizonettes on the top floors have perhaps the finest views on the entire bay. The hotel owner organizes a free boat trip around the coast. During this cruise you will be able to see and make photos of one of the best beaches of Skopelos Greece – Kastani beach; Chovolo beach; Milia beach. 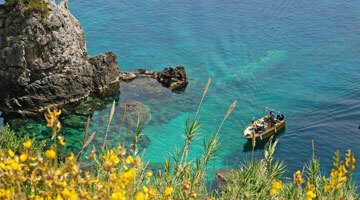 Finally you will see a cove in a small island where the mediterranean monk seals hide their babies during the winter. This place is a rich fishing area. The endangered mammal chooses this inaccessible cave every year in November to get rid of human disturbance during gestation period and pups care. This habitat also protects seals from storms. We recommend an early-bird booking for Hovolo apartments. The earlier you book, the less you pay even for a room during peak season. We booked in January a 7-day stay in August for 3 people with breakfast included and paid only 342 euros! Take into account that there is only one doctor in Elios Klima village. If you need medical care, you have to go to Skopelos town. Local people told us that they travel to Volos to visit a dentist. There are pharmacies in Skopelos town and Glossa. Compared with neighbouring accommodation – Milia apartments on Milia beach, Hovolo apartments are located in more lively area with a dozen of Greek restaurants (tavernas), cafes, mini-markets, ATM and a bakery. Just a few steps from the hotel there is a fish restaurant “Captain Spiros” with live music on Fridays and Sundays. Restaurants in Elios Klima village are similar in price and menu choices. The typical Greek salad is priced at 5,50-6 euros; the Tzatziki salad(yoghurt and cucumbers) is 3,50-4 euros; a portion of grilled octopus – 12 euros; grilled sardines – 7-7,50 euros; a litre of house wine is 6-7 euros while a pint of beer is 3-4 euros. During our holiday in Scopelos Greece we also liked Milia apartments on Milia beach. The complex of houses is built amphitheatric. 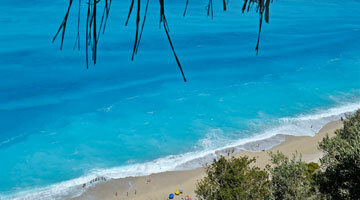 The Skopelos villas are located just a stone’s throw from the beach. 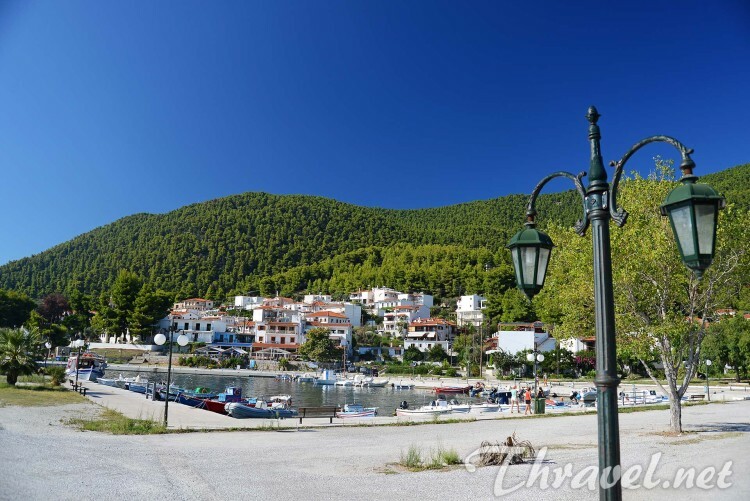 Milia apartments are situated at 12km from Skopelos Town and 15km from Glossa. 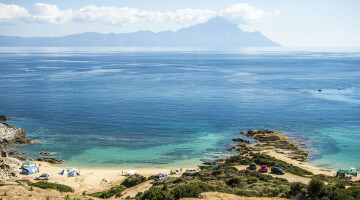 This Scopelos hotel is the closest to the famous Kastani beach (Mamma Mia! beach). 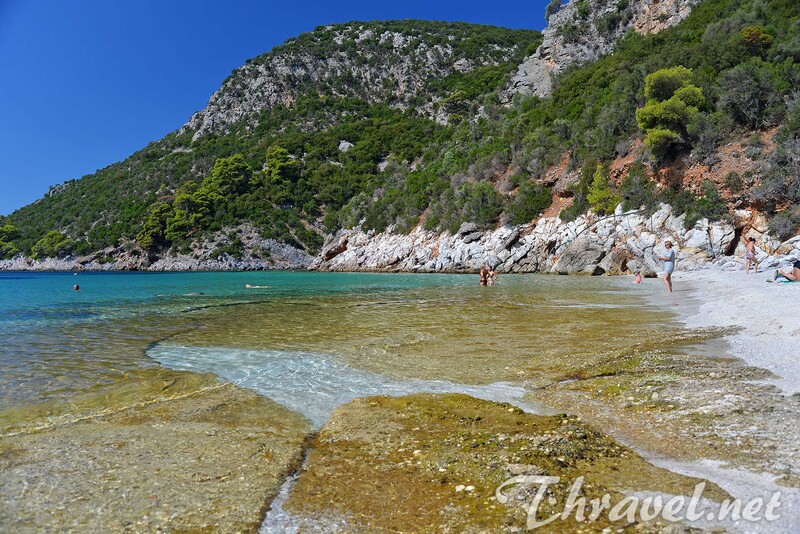 Just 1 km from Milia apartments you would find the spectacular beach of Panormos. All verandas feature sea view and free Wi-Fi access. Hotel`s guests use free chairs and umbrellas on Milia beach. Prices in Milia apartments are affordable in June and September – 40 euros for a double room. In July and August you will have to pay 80 euros to rent a studio for two persons. Local people claim that September is the best season to visit Skopelos Greece because the sea gets warmer but the day is shorter than in July and August. The only downside is its isolation. There is only one taverna next to the hotel. There is no mini market or ATM/ cash machine in the Milia beach area. But the restaurant is really famous. 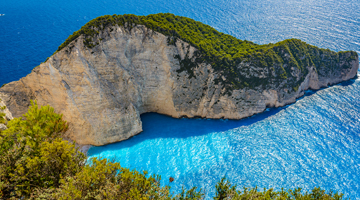 This sandy beach is world-famous as the place where Mamma Mia! The Movie was filmed. Since 2008 this spot gets overcrowded during peak season. The main reason is that the turquoise sea is amazing for snorkeling. You will be able to enjoy a close encounter with Aegean marine life. 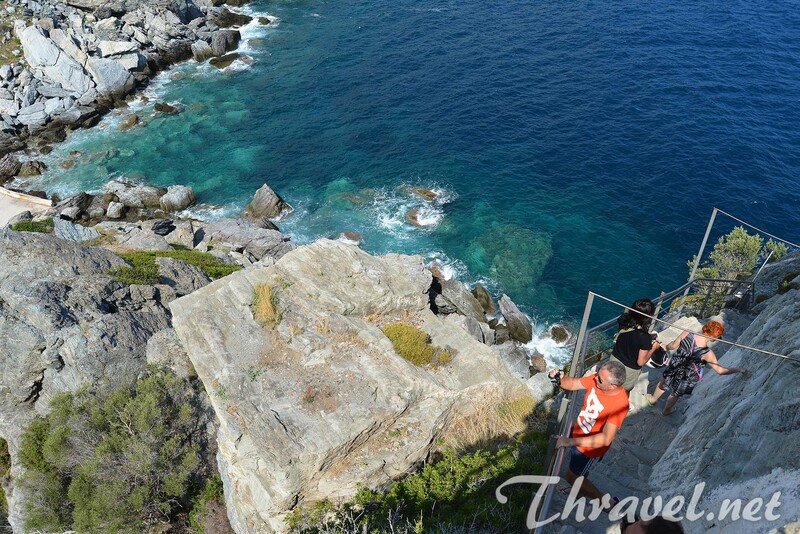 Furthermore you can explore dozens of coves and small secret beaches along the coastline. On the Kastani beach there are free sunbeds and umbrellas if you order something to drink in the beach bar. The cold Greek coffee (frappe) is priced at 3 euros, fresh orange juice – 4 euros, an alcoholic cocktail such as Margarita, Mojito, and Cosmopolitan – 8 euros. Kastani is one of the best Skopelos beaches featuring fine dark gold sand, clean and peaceful water, and spectacular green hills. 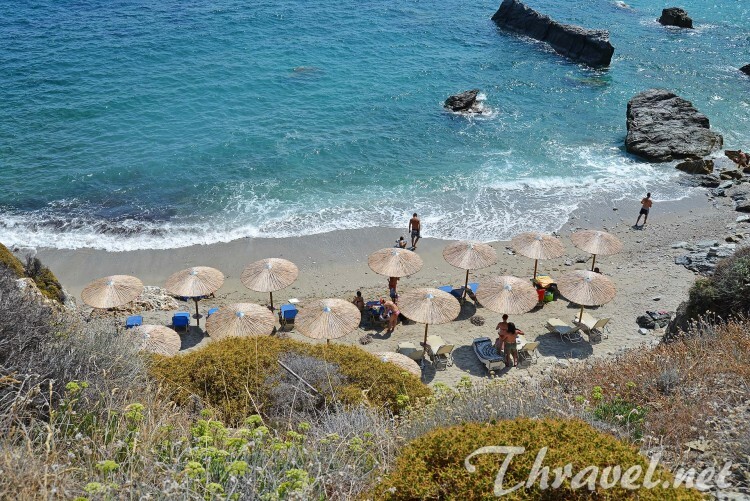 There is not a restaurant on this beach but you can walk via a little path through the pine trees to Milia beach where you can find very authentic Greek tavern. There is plenty of parking space next to Kastani beach bar. Milia beach is next to Kastani beach. The longest beach on the island is a blend of rough sand and colorful pebbles. 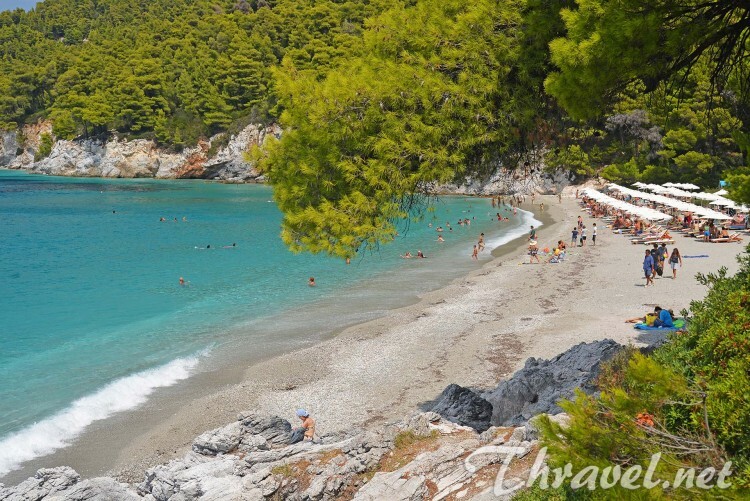 The right part of this Skopelos beach features tranquility and picturesque natural surroundings. There you can swim around rocky cliffs and tiny coves. 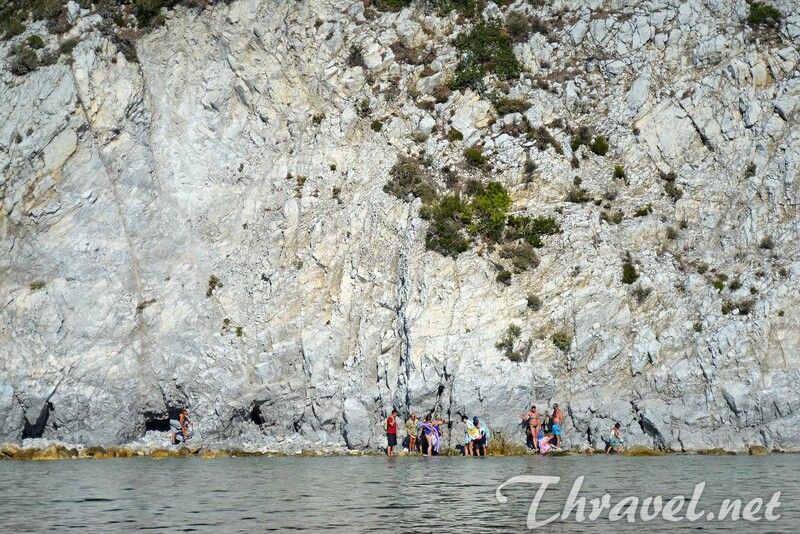 This place is convenient for children to swim and their parents to enjoy the view of the islet Dassia. However consider that there is a slippery layer as you enter the water. Sunbeds and umbrellas are free if you buy something to drink from the tavern. The middle part is for fun seekers. All the party people come here to dance and have fun on the beach. There is a cool bar that plays party music. The left corner is for nudists. This pebble beach is perfect if you want to stay alone. 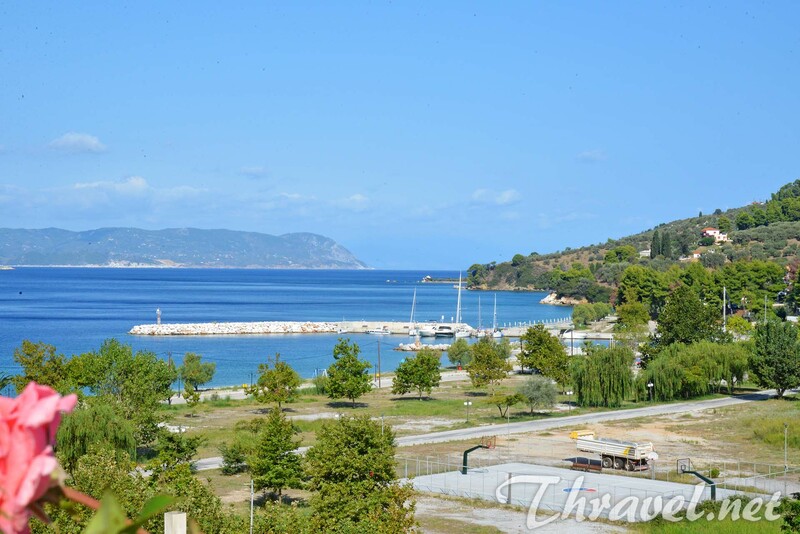 The main highlight of Milia beach is the restaurant where you can see two photos of tavern`s owners next to the famous Hollywood stars Meryl Streep, Piers Brosnan, Colin Firth, Stellan Skarsgard and Julie Walters. Food is delicious but service needs improvement. 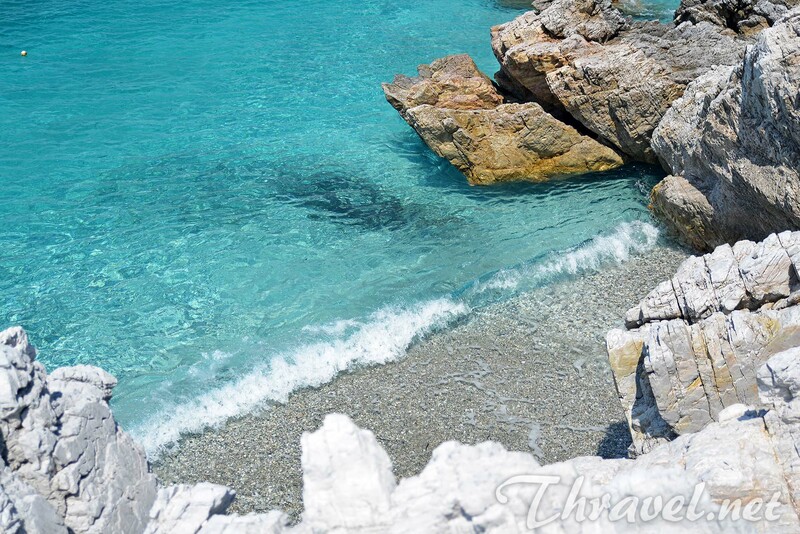 This pebble beach is located on the north of the Skopelos town. 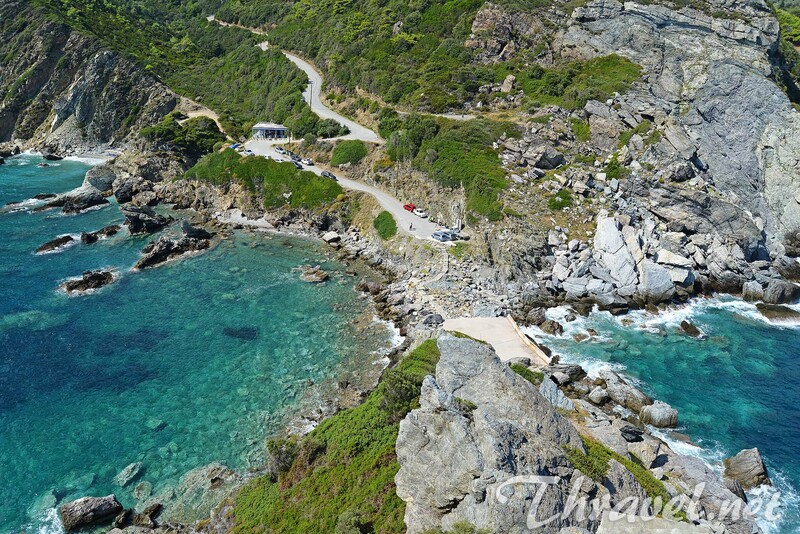 The marvelous bay is surrounded by dense green vegetation. There are many restaurants as well as mini markets in the area. Here tourists can hire a bike or a boat. Sunbeds on Panormos beach are free if you order drinks or snacks from the tavern. The water gets too deep for children within the first few meters but the place has lifeguards in attendance. 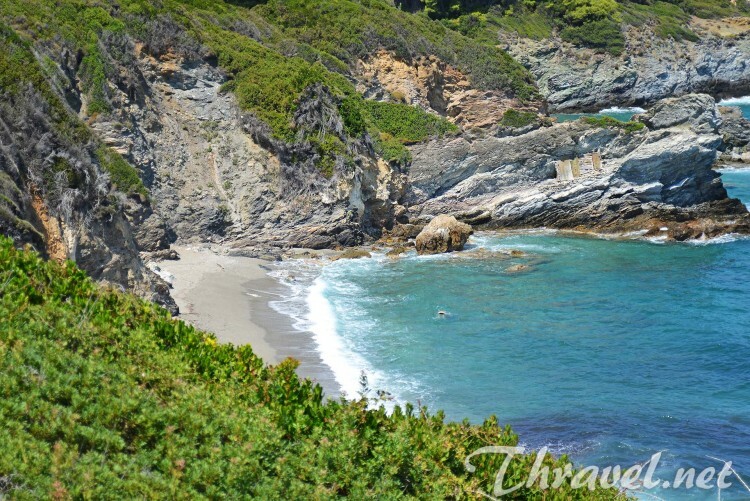 This is one of the most picturesque beaches on Skopelos Greece with a view of the Mamma Mia! Movie Wedding chapel. 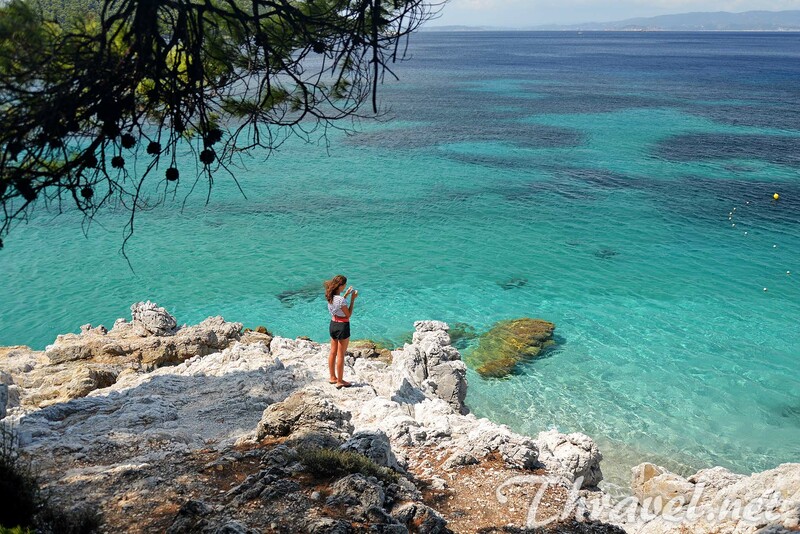 The bay is located 8 km from Glossa and 30 km from Skopelos town. Cars can’t get to the beach so to reach the tiny secluded Agios Ioannis beach you have to go down a steep rock path. The area is covered with a mixture of sand and small colored stones. The sea can be very wavy if it is windy. You can rent an umbrella and sunbeds for 5 euros. Drinks and snacks are served on the beach. 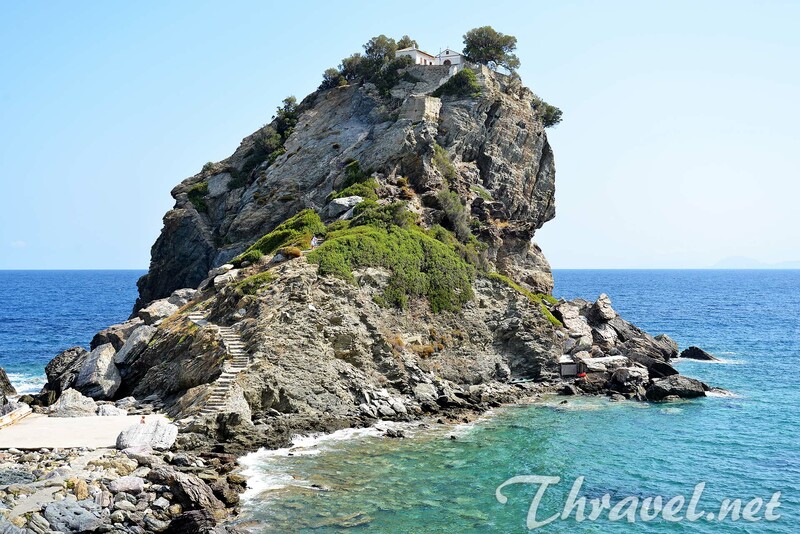 A day trip to Agios Ioannis Beach Skopelos necessarily includes visiting the small church perched on top of a stunning rock in the Aegean Sea. To get there you have to climb 200 steep steps. 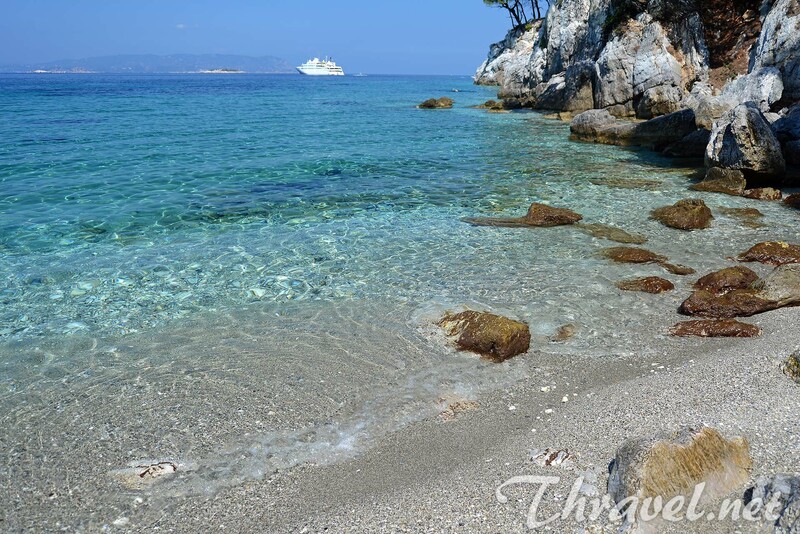 This secluded and remote beach is located at 4 km from Glossa village. The beach is surrounded by towering cliffs. It offers dramatic views of the overwhelmingly green hills and turquoise water. There are no umbrellas, sunbeds, taverns or toilets there. Anyway after 5 pm it becomes lively. This beautiful spot is inaccessible to cars – you have to leave the vehicle on the hill and then walk down the path to Perivoli Beach. 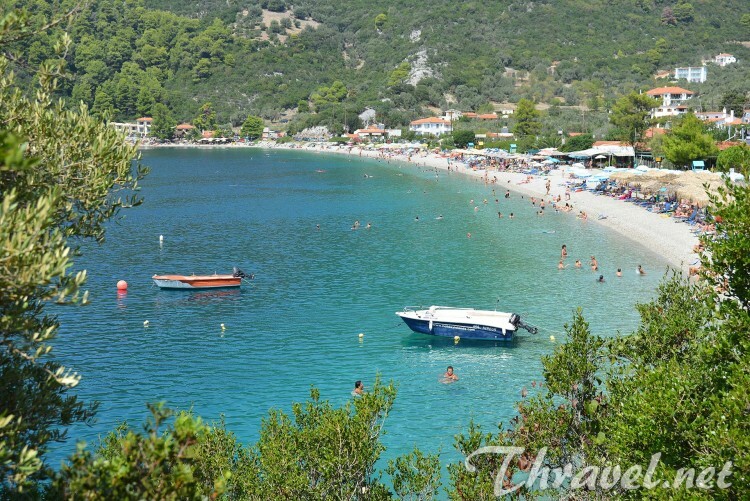 Limnonari is one of the closest beaches to Skopelos town. It is sandy and backed by green hills. Most taverns here will charge you 4 euros for a sunbed. 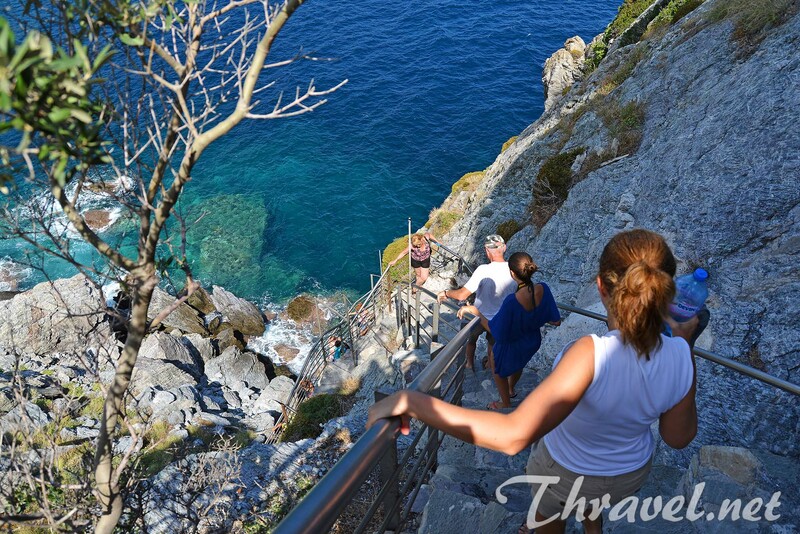 The color of the sea and surrounding natural interior is marvelous but the access to the water can be difficult due to a slippery bottom to cross. After this layer the sea gets very deep. Agnondas is a small, charming bay with pebbly beach. 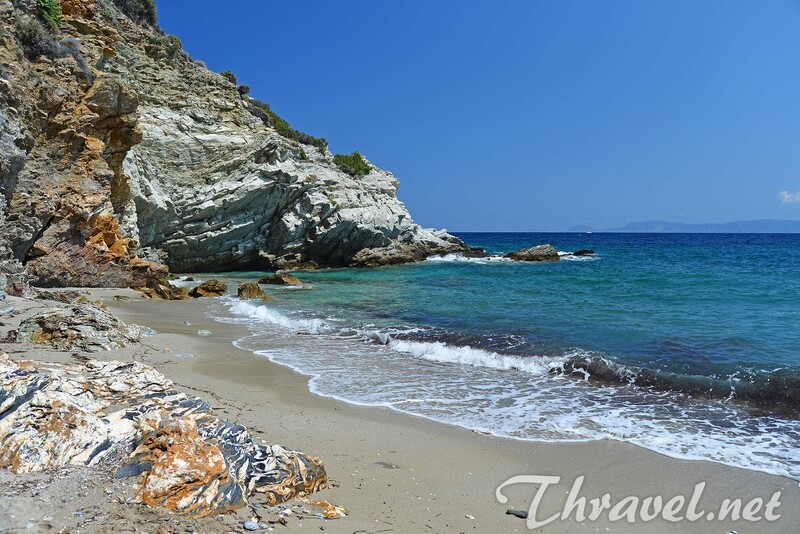 This quiet beach is not far to Skopelos town. It is located south from Limnonari. Looks like a hidden gem but there are many people wanting to be on it. That is why it is difficult to find sunbeds and umbrellas. At least you can have lunch in one of the authentic Greek restaurants offering perfectly cooked fresh fish. 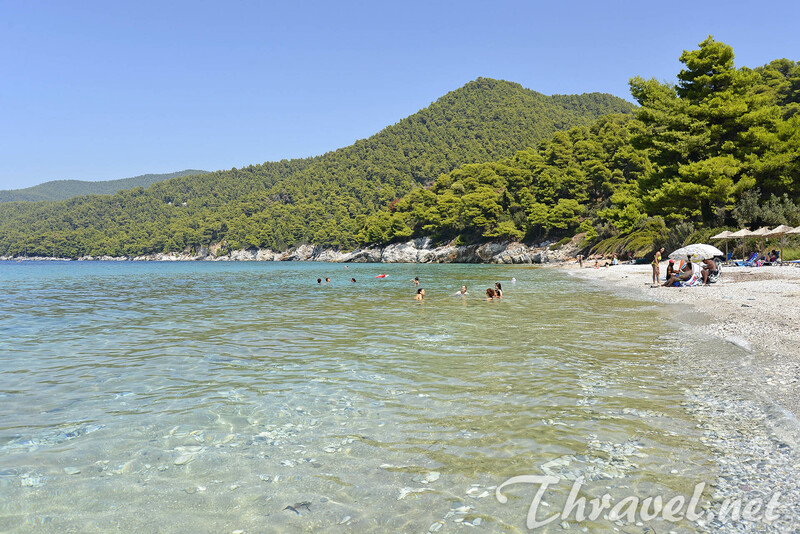 There is one absolute gem on Skopelos Greece and this is Hovolo beach. It is a short distance avaw from the Elios Klima beach but the access is difficult. You have to walk along the stony and slippery bottom to get there. There are no umbrellas, sunbeds or cantina there but this is the perfect way to escape the crowds and enjoy the exquisite beauty of Skopelos Greece. 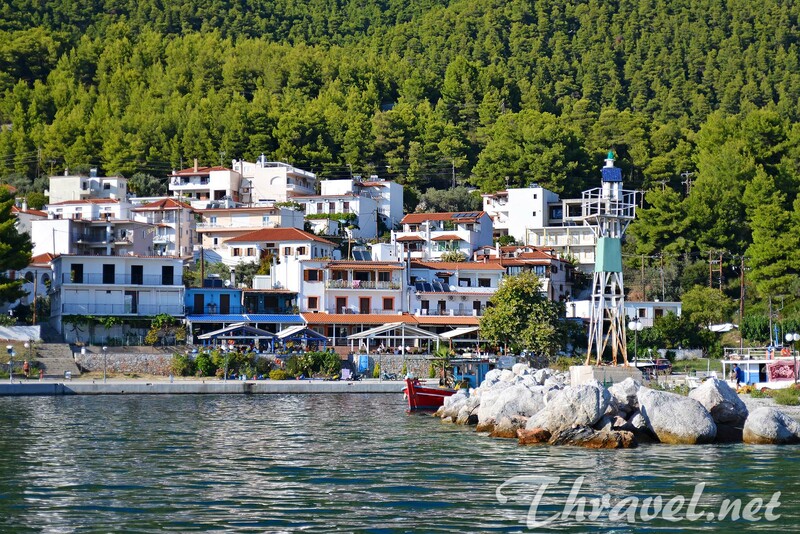 Skopelos town has maintained the authenticity of the traditional Aegean lifestyle. 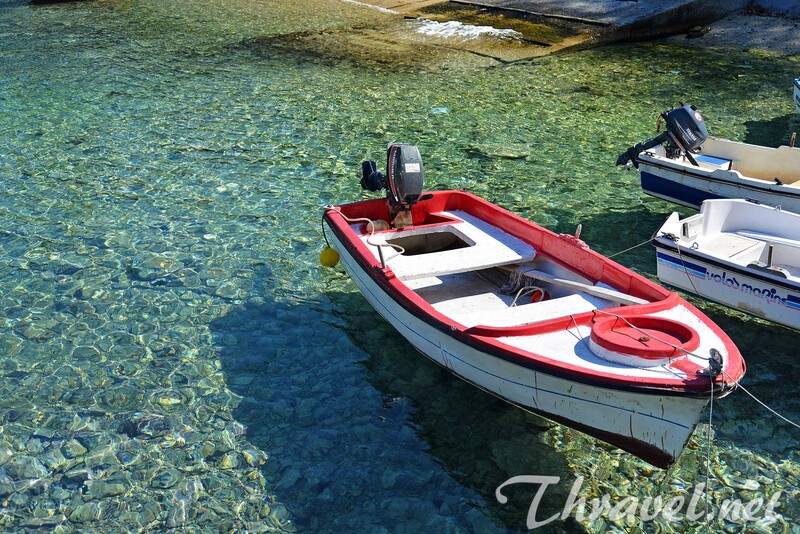 It is considerd the most unspoiled and beautiful town of the Sporades archipelago. In Skopelos Town you can find delightful restaurants, cool bars, creperies, and souvenir shops. The town features dozens of chapels and churches. 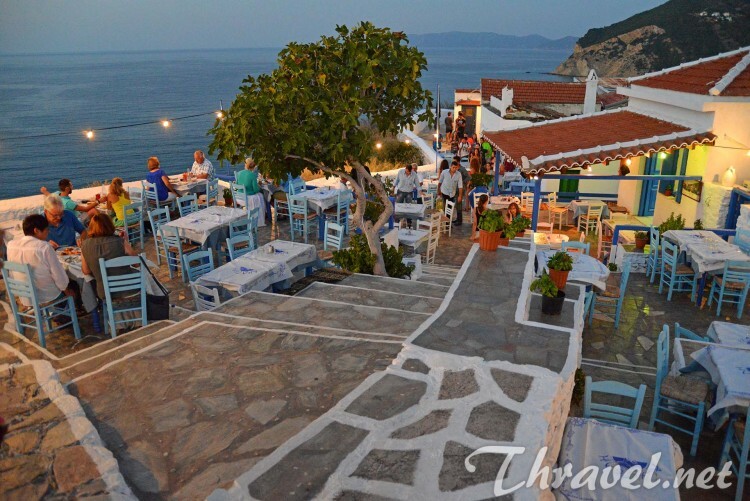 If you like to have dinner while listening to live Greek music then the Anatoli tavern is the best place in Skopelos town. This is a great experience, as the restaurant is on top of Venetian castle with an amazing view over the town and the island of Alonnisos.